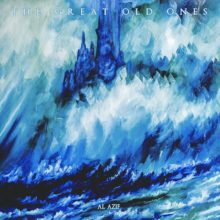 THE GREAT OLD ONES’ first album ‘Al Azif’ was hailed as a success by the international press. After appearing in many of 2012’s lists of top albums as well as numerous shows and festivals (HellFest 2013, Roadburn 2014) the band is back in 2014 with an album out of the ordinary. Once again recorded by Cyrille Gachet (YEAR OF NO LIGHT) and mastered by Alan Douches (BARONESS, MOTORHEAD, SEPULTURA, SIGH, THE SECRET) Tekeli-li is a true eye opener. Les Acteurs de l’Ombre is extremely proud to work with THE GREAT OLD ONES and to present this incredibly varied, intense, and personal second album. To this day it could very well be the best album that LADLO has had the privilege to put out. Tekili-li pays homage to H.P. Lovecraft; taking the listener on a breathtaking adventure through the Hallucinated Mountains. Upon hearing the pre-production our team was blown away by the work of the 3 guitars and the dark and tortured Lovecraftian atmosphere they create, not to mention the unique nearly jazzy percussion. Needless to say, we are absolute fans of this album and we could not keep ourselves from going all out regarding the format. Hence, we are offering a CD digipack version, a double LP gatefold, and a limited edition box set including a highly limited edition of the novel At the Mountains of Madness illustrated by Jeff Grimal (Guitar/vocals). Re-press of their first album Al Azif, initially released by Antithetic Records. New artworks.